The artwork is a commissioned piece which uses bark cloth, seashells, found objects, woven fabrics and acryllic paint to create a deeply textured and dramatic work of art. Barker came to th U.S. for two months specifically to work on the project with Yusuf Ssali. Bark cloth is a traditional Ugandan material which is made form the bark of the Mutuba tree. It has been used for religious ceremonies for over 500 years. CHRISTIAN DIEGO IS STUDENT OF THE MONTH AT NAMUNGOONA CHILDREN'S ART CENTER--- Christian, 13, is a refugee from Democratic Republic of the Congo. He attends Namungoona Orthodox Primary School. He started coming to Children’s Art Center in 2017 and attends nearly every day. 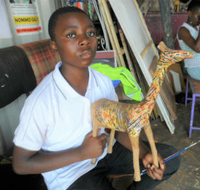 He is a talented painter and is now learning to make sculpture using wire armatures and papier mache. Pictures of Yusuf Ssali now look out at passengers of the San Francisco subway known as the Bart. The video screens at Montgomery Street and Powell street Bart Stations advertise Ssali's exhibition at Joyce Gordon Gallery which is part of the October Oakland Art Murmur. 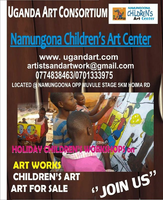 Kids artwork from Namungona Children’s Art Center will be on exhibit in June at Uganda’s National Art Gallery in Kampala. 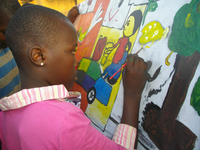 Over 200 children took part in art workshops at Namungona Children's art center in December during the school holiday. 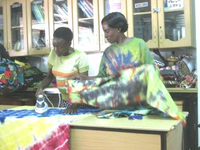 Classes were conducted by James Nsamba and Farouk Mukwaya. The kids painted on canvas with acrylics, and used paint and fabric scraps to create beautiful mixed media collages. Here's an wonderful new easy way to support Kisa Foundation USA, and it won't cost you a cent. Anytime you want to buy something on Amazon, log into smile.amazon.com and specify Kisa Foundation USA from the "pick your own charitable organization" window. From then on, Amazon will donate 0.5 % of everything you spend to Kisa Foundation. You get all the same products on smile.amazon as on regular amazon, and at the same prices so the transition is painless. So far, smile.amazon.com has donated $46 million to designated charities. Help us continue our work of providing art therapy to HIV-AIDS patients, and free art workshops for orphans and street children in Uganda. Register for Amazon Smile now, and pick Kisa Foundation USA as your charity of choice. A majority of his close friends are female, most of his clients want women-themed works, and most of the people who collect his works, locally and internationally, are women. How then can one possibly be wrong to conclude that renowned Uganda acrylic painter Yusuf Ssali is the ultimate 'ladies’ man' – at least in the artistic sense? In reality – and let’s get this straight – Ssali is a married in a stable relationship. In fact, he is not known for philandering. The thing is that Ssali has a special thing with women, which has trickled through his art for the past thirteen years like no other subject. This is accentuated by his sphere of influence being dominated by womankind. They all have been mesmerized by one thing – African women. Moreover, Ssali is not alone in this enterprise; countless Ugandan artists have arrogated themselves the responsibility to ‘speak’ for women and have, in the process, rendered the female body in their art in a plethora of forms ranging from glamour to the lewd, all for different reasons. The woman’s breast has suffered the greatest wrath of artists as they have sought to define and redefine it in infinite of shapes and colours. Ssali has, meanwhile, sought to bring out womankind’s side that appeals to a universal audience without having to vulgarise her. This could probably explain the special love relationship between his audience and his work for such a long time. Since he graduated from art school at Makerere University in Kampala in 2003, his practice has been limited to acrylics, a water-based paint medium because of being allergic to oil-based paint. In acrylics, he wrought semi abstracts works with no clear depiction of the women’s facial details. The intense primary colours that dominate his palette have radiated the subjects in all their grace and charm in a way that quite easily casts an entrancing reaction. Ssali has since the recent past been gradually gravitating towards another genre in the form of non-representational abstraction whereas keeping faithful to ‘his women’. In this genre he employs a wide-ranging colour palette to experiment and come up with works that have little or no affinity to forms in the natural world. This approach is increasingly becoming popular among his collectors. It was made popular during the age of post-modern Abstract Expression that started in New York in the 1960s championed by the likes of Jackson Pollock and Any Warhol. It was at first defiance against the established norms of formalism but now it has been entrenched as the de facto technique practiced around the world today. Since last December into mid this month, Yusuf Ssali’s works were on exhibition at AKA Gallery in Kamwokya, Kampala, one of Uganda’s leading spaces keen on promoting a dynamic array of techniques from modern art to the avant-garde. He has been widely exhibited in France, Belgium, Germany, Netherlands, the United States and, of course, Uganda. Over 100 paintings and prints by Uganda Art Consortium members will be on display at Berkeley Arts Festival Gallery Nov. 5-30. The Gallery is spacious, well laid out and centrally located at 2133 University Av. in downtown Berkeley, just a few blocks from the University of California campus. This will be one of the largest shows we've ever held. Artists include Kaspa Kasambeko, Yusuf Ssali, James Nsamba, Chaz Mbazira, Farouk Mukwaya, Kizito Fred Kakinda and Mathias Tusiime. Well also have numerous works by kids from our children's workshops and crafts from the Mulago Hospital programs. A new shipment of craft items from our Mulago Hospital workshop is on its way from Uganda and should be here in time for the KPFA Crafts Fair December 17 & 18, at Craneway Pavilion in Richmond CA. About a dozen patients in the art therapy workshop made aprons, hand bags and jewelry which we'll sell to raise money to continue the programs. Hundreds of HIV-AIDS patients at Mulago have participated in our programs there led by Kaspa Kasambeko, Yusuf Ssali, James Nsamba and Farouk Mukwaya. Over 200 kids in Namungona are expected to attend a new series of free art workshops starting Sept. 24. The month long workshops coincide with school holidays and feature training in tie-dye, jewelry making and painting and drawing. New Research by a Drexel University College of Nursing professor shows that just about 45 minutes of free art-making in a studio attended by an art therapist was enough to increase patients' confidence in themselves and their ability to complete tasks. One day in June we took a bunch of kids from Namungona to Nansana to meet some of the players in the Nansana Youth Football League. We watched the players practice, and we all had a great time. The kids made sketches of what they saw on the football pitch that day, and later they created several paintings based on their experiences. It was a very successful outing. 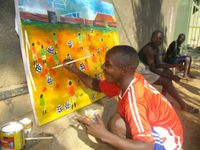 Uganda TV News show features Kalerwe kids art program started by Mathias Tusiime. The public is invited to visit Namungona Children's Art Center to learn about our educational and therapeutic art activities. Enjoy, ponder and purchase art. Proceeds support the Center and our related community activities. Click the adjacent image to view a poster with details.